Experience a scenic journey from Seward to Denali via Park Connection motor coach. Enjoy dinner and a show at the Music of Denali Dinner Theater at McKinley Chalet Resort featuring family-style dining and a spirited original musical about the first men to reach the summit of Denali. With two nights at Denali National Park, there’s ample time to experience the abundant wildlife and to visit viewpoints for the "Great One." Enjoy our luxury rail on your return to Anchorage. Overnight in the largest city in Alaska. This tour provides plenty of time for you to explore the Denali area and experience the many optional tours offered in Denali. This tour can connect with Royal Caribbean International and Celebrity Cruises arriving into Seward. Cruise is not included in this tour. 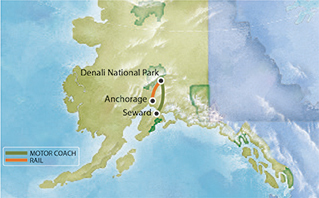 Board your deluxe motorcoach for a scenic journey north to Denali National Park and Preserve. Upon arrival at your Denali-area hotel, unwind with the locals at Lynx Creek Pizza or take advantage of the long daylight hours with a walk on one of the nature trails. Overnight at Denali-area hotel. Wake up for optional morning activities. Later, board our luxury domed railcars and begin the journey to Anchorage. Overnight Anchorage hotel.